The internet has lit up in the last three days or so with people getting (over? )excited about activity at the volcano of Bárðarbunga in Iceland, particularly since the Icelandic Meteorological Office have been gradually ramping up the Aviation Colour Code from green (“normal, non eruptive”) through yellow, to orange (“heightened unrest, increased likelihood of eruption / eruption underway with no/minor ash”). Situated beneath the Vatnajökull glacier in the South East of the island, it’s yet another hazardous volcano that people didn’t even know was there to be worried about. As a result, there seems to have been a lot of scrabbling about and information gathering going on by all the media outlets, matched only in its haste by the appearance of click-baity rubbish bearing such informative titles as “Livestream a Gigantic Volcanic Eruption”. The edit history on wikipedia is itself a sight to behold. The volcano is notable for producing the largest known lava flow on the planet for the last 2 million years or so, with a volume somewhere between 21 and 30 cubic kilometres. This, however, is atypical behaviour; with smaller scale activity being relatively common. Indeed, that list suggests there may have been activity as recently as 2008. The issue being that the presence of the large glacier overhead precludes direct observation, so the only chance of confirming eruption is if it is significant enough to burn its way through the ice cap to give us a tephra layer. The more recent activity is inferred purely from seismic monitoring, similar to what was done with the monitoring much of the submarine El Hierro eruption a few years ago. The other intersting feature of volcanoes located under icecaps is the associated flood risk when that water gets melted – the Icelandic Road and Coastal Administration just released this traffic prohibition over an area of several hundred square kilometers due to flood risk. Anyway, the Global Volcanism Program has a pretty comprehensive description of the volcano, with related bulletins, photos and background, so I won’t sit here repeating what you can get elsewhere. There’s also an excellent breakdown of the seismic activity here, showing a really beautiful migration of the seismic source through time. Below is a video demonstrating the 3D distribution of quakes in the last few days. I thought I might try and add to the proceedings by speaking to someone with some expertise on the subject; Dr Christina Manning, a geochemist at Royal Holloway, University of London who has been working on Icelandic volcanism for the last 10 years or so, and is particularly interested in variations in the mantle below Iceland, and what the products of the different volcanoes can tell us about the structure of this very complex and highly productive system. I caught up with her today to get the low down on some of the more subterranean aspects of this interesting case study. What type of volcano is Bárðarbunga? What’s the magma like? The Bárdarbunga- Veidovotn volcanic system is 190 km long and up to 28 km wide, covering about 2500 km2 which makes it Iceland’s most extensive volcanic system and the second most historically active (Thordarson and Larsen 2007). Bárðarbunga is the central stratovolcano of this system. In contrast to what may be expected from magmas erupted at a stratovolcano, analysis of tephra glasses from historic Bardabunga eruptions show the lavas to be predominantly basaltic in composition. Volcano-ice interactions are a significant influence on the formation of Icelandic stratovolcanoes, giving rise to alternating lava flows and volcaniclastic deposits which generate the steeper flanks than observed on subaerial Icelandic central volcanoes which tend to be flatter shield volcanoes. What type of eruption might we expect? The subglacial situation of the Bardabunga volcano means that despite its relatively basaltic composition interaction with ice has the potential to erupt explosively. This could give rise to an ash plume as observed during the Eyjafjallajokull eruption. But depending on where the vent opens it could initiate a fissure eruption similar to that seen at Grimsvotn which would be less explosive and more effusive, generating fire fountains and lava flows. How does Bárðarbunga relate to the likes of Eyjafjal, Grimsvotn and Katla? Do they share any plumbing? The lavas at Bardarbunga appear to be less evolved than those observed at Katla and Ejafjall but there is probably a sampling bias here due to the limited access to material at Bardarbunga which means that analyses are constrained to tephra. This means that the risk of a very large eruption as speculated for Katla is significantly reduced. The activity at Bardarbunga is more likely to be similar to that of Grimsvotn given their similar locations relative to the areas of active rifting and the similar lava chemistry. There is no geochemical evidence for shared magma plumbing between the Bardabunga-Veidvotn system and Eyjafjall or Katla. There is evidence of interaction with magmas from the rhyolitic centre of Torfajokull within the Veidvotn lavas which suggests some shared plumbing. 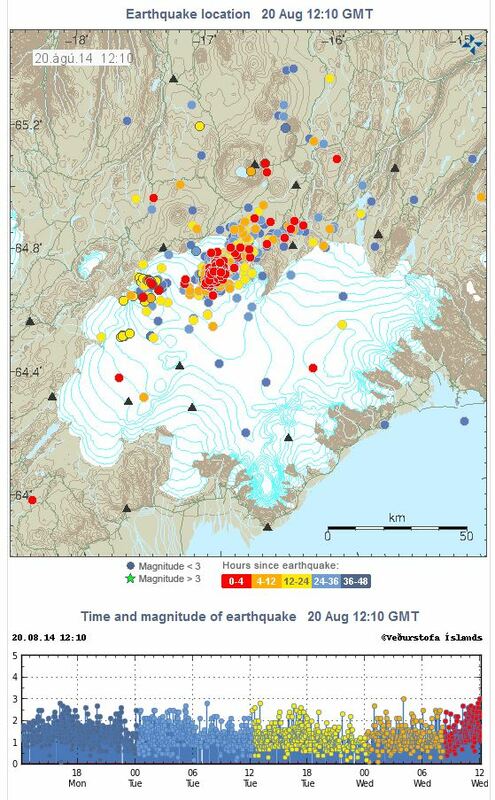 Whilst there doesn’t appear to be any link between activity along the Veidvotn fissure and that at Torfajokull there is always a risk of triggering eruptions in linked systems by magma movement and depressurisation. Is there anything unusual about this activity? Not really given the geodynamic situation of this area of Iceland. We are essentially looking at the subaerial version of a mid ocean ridge so regular volcanic activity is to be expected along the spreading ridges. Put on top of that the presence of a mantle plume centred beneath the Vatnajokull glacier and the amount of volcanic activity in this region seems relatively minor given how favourable the geodynamic conditions are for melt production and transport to the surface. Where does geochemistry come in to all of this? Being a volcano/geochemistry enthusiast means that i take great joy in working out what goes on beneath areas of volcanic activity from the mantle up, but as someone who works on predominantly older deposits it is sometimes difficult to persuade people that what you are doing is important. Then a volcano gets a bit rumbly and suddenly people want to know what its connected to? what are the implications of magma movement along a certain system on the risk of eruption at other centres? And that is when geochemistry of both old and young samples can be particularly enlightening. Earth Scientist with a background in volcanology and sedimentology. Enjoys a good rant, beer, and games. Dislikes reality TV, crowds, and unreasonable people. This entry was posted in Earthquakes, Geochemistry, Geology, Geophysics, Hazard Assessment, Volcanism and tagged Bárðarbunga, Earth science, Geology, Hazard assessment, Iceland, Science, Volcanic ash, volcanism, Volcano. Bookmark the permalink.